Welcome to the newest Unofficial Panerai Resource on the web, complete with tons of information on Modern and Pre-V Panerai watches in a easy-to-use format. Find everything you need here, and join the forums for some easy conversation and chat with fellow Panerai addicts! There are no vintage models currently on the site, but we may add them in the future. We are NOT affiliated with Officine Panerai in any way. February 13th, 2019 - New DaLuca straps review posted with a couple of sweet straps. A nice Shell Cordovan and a sweet Vintage Swiss Ammo leather strap - both very nice pieces. August 1st, 2018 - Major update to the site structure. Revised from the Historic/Contemporary categorization to be based on the case style: Radiomir, Radiomir 1940, Luminor, Luminor 1950 and Luminor Due as well as some of the old categories and the Special Editions that still remain. February 21st, 2018 - Reviewed an up-and-coming strap maker from the Ukraine, Man Cave Leather. Some incredible value here, and not to be missed if you like bang for buck straps. These guys are superb. October 31st, 2017 - Just posted up my second review of kyRos watch straps from Greece. kyRos is a fantastic strapmaker that painstakingly replicates all the smallest details to recreate vintage Panerai strap masterpieces. October 6th, 2017 - Just reviewed a second strap from Lac Crado, a beautiful Crocodile strap that looks to be a good OEM replacement for tang buckles. Great value on this quality Crocodile strap from Singapore. If you have taken Panerai photos that you'd be willing to let me use on the site, I would be very grateful if you would send them to me! Remember to Join the Forum! Please join the forum! 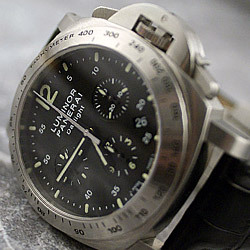 Together we can make this the premier place to discuss Panerai watches. No drama, just good times. A place where you don't need a lot of moderation because we all try to act like adults! Feel free to email me corrections to the information listed here, or to help out with some pics!